Home > PRECIOUS MOMENTS > May Your Birthday Be As Special As You! Precious Moments May Your Birthday Be As Special As You! May Your Birthday Be As Special As You! 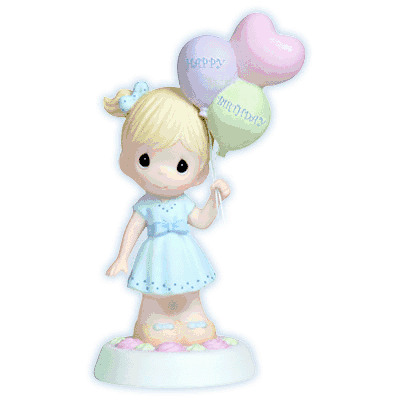 A balloon bouquet of special wishes is just what the birthday boy or girl deserves to celebrate the happy occasion. This cutie in her eyelet trimmed party dress shares a smile and sweet sentiment on your behalf. Bisque porcelain figurine. 6"
Item#: 112010 - Height: 6"